Bike designer Kirk Pacenti is into big wheels. He was riding 700C and 700D wheels in the early 1990s, has been a long-time proponent of 29ers, and probably even rode one of those plastic "Big Wheel" tricycles as a kid. But now he has seen the MTB future and the wheel size is 650B. With 650B wheels (which measure 27.5" in diameter, half-way between 26" and 29" wheels), full-suspension bikes can be produced with 4" to 6" inches of travel and throughout a wide range of frame sizes without abandoning proven 26" wheel frame geometry. 650B wheel bikes can be designed for a wide variety of uses from XC racing to 4X and DH racing. 650B wheel bikes can accommodate riders 5' 3" to 6' 4" tall or more. 650B wheels offer great obstacle roll-over capabilities for a smoother ride. Consumers are already demanding 650B bikes and bike designers are producing the bikes. "What I believe 650B wheeled mountain bikes will allow builders to do, is to utilize proven 26 inch wheeled geometries, coupled with the largest wheel possible in a bike with little or no geometry compromises," says Pacenti, president of Pacenti Cycle Design, which supplies product and support to frame builders. "As 140mm travel bikes become the norm (even for XC bikes) the 650B wheel size is going to make even more sense." Granted, the biggest obstacle to any new wheel size is tires, but Pacenti has already covered that rocky ground. 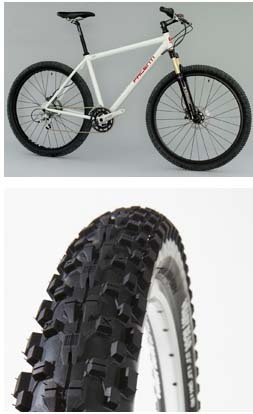 A Pacenti-designed and branded Panaracer-made 650B tire  the Neo-Moto  is currently in production and will be available by mid-September. In addition, White Brothers is producing suspension forks for the new wheel size, and Velocity USA, which has built 650B rims for the bicycle touring market for years, is already in production of their new "Blunt" all-mountain MTB rim. Because the 650B wheel size is compatible with many 26" wheel components numerous parts are already available. For instance, Maverick forks can be easily optimized for 650B wheels with a travel reduction kit, and some current 26" and all current 29" disk specific suspension forks will work with the 650B wheel size. Noel Buckley of Knolly Bikes, who understands the impact wheel size has on full-suspension frame design, says: "Kirk's forward thinking vision is correct in that 29'er wheels don't work well for frames with more than 100mm of rear travel. While working on the design of a 29er version of our new Endorphin frame, we started realizing that serious compromises would need to be made to the frame geometry due to undesirable forward wheel paths, chain stay lengths, and BB height all caused by the large 29" wheel diameter. "Kirk knows what he's talking about. The 650B wheel size makes more sense for a company looking to produce big wheeled bikes in the 100 - 150mm travel category because they get the rolling benefits of the larger tire, but don't have to modify frame geometries much, or have to contend with the design compromises imposed by 29 inch wheels." "I am fully committed to the 650B wheel mountain bike," says Pacenti. "I have been receiving daily inquiries from custom builders and even consumers who are very interested in the wheel size. Support for this project has been overwhelming. I truly believe 650B wheel bikes have a bright future in mountain biking."